Depending on the reason you are undergoing your physical exam, the instructions from your doctor about what to eat may vary. Follow your doctor’s orders about what to eat before your health checkup. If you suspect you may have some negative results from a physical examination, you may increase the odds of scoring low in various areas because of anxiety. If you didn’t receive specific diet instructions, you can take measures to ensure more positive results. 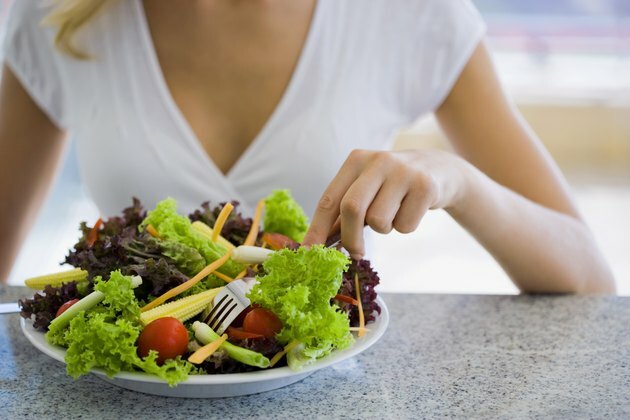 If you are undergoing a regularly scheduled physical examination, you should maintain your regular eating habits so that you can relay to your doctor any difficulties you may be undergoing. In addition to asking about your family history, your doctor will want to know about any problems you may be having. By maintaining your regular diet, you can report on digestive discomfort such as heartburn or indigestion that could indicate a more serious condition. According to the Center for Disease Control and Prevention, you should tell your doctor about changes you’ve undergone in your eating habits. Changes in eating habits could signal a host of other health problems. To maximize healthy results from a physical, you should maintain a healthy diet for at least a week before the check-up, according to Accuquote, a site devoted to life insurance information. The better your scores on various tests, the better chance you have of getting lower insurance rates. Limit your use of salt to maintain a healthy blood pressure reading. Avoid foods heavy in sugar and trans fats to reduce your triglyceride levels and consider eating oatmeal every day to lower your cholesterol levels. Avoid food and drink that can negatively impact blood tests and heart rate levels. Alcohol can elevate liver enzymes, so you should avoid drinking alcohol for at least 72 hours before a physical. Reduce or eliminate the amount of caffeine you eat and drink the day of your exam because caffeine can cause your blood pressure to spike. Don’t smoke when going for a physical because nicotine reduces the flow of blood to your veins and can make drawing a blood sample more difficult. Limit the amount of exercise you do for a couple days before the exam because strenuous exercise increases the amount of protein in your urine. Whether you are going in for a routine physical examination or following up after a medical procedure or illness, getting a check-up can produce stress and anxiety. In addition to getting sufficient rest for the days leading up to your physical, you should increase the amount of fruits and vegetables you eat so that your body can adapt in healthy ways to the additional pressure, according to Military.com. Maintain a healthy blood sugar level by eating lean protein and additional servings of fruits such as bananas, apples and carrots. Drink herbal tea without caffeine to help calm your nerves. Additionally, you should increase the amount of water you drink each day for a week or so prior to the physical to flush toxins from your body that could influence test results. Fluids also help you prevent dehydration, which can lead to anxiety and fatigue.